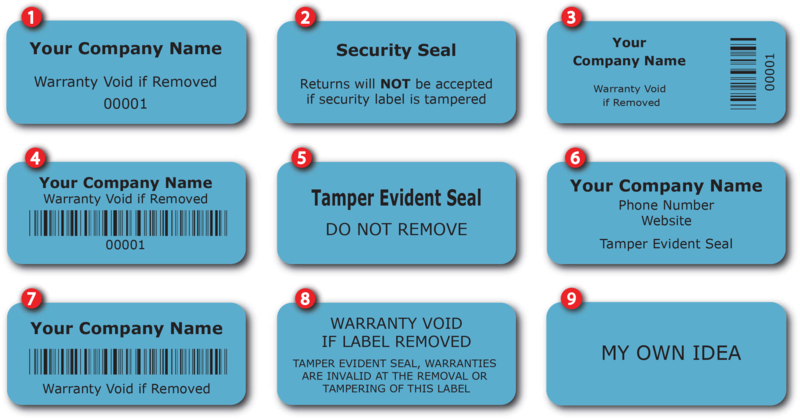 10,000 White Destructible Security Labels 1" x 0.375" (25mm x 9mm), Custom Print. >Click on item details to customize it. * Designed to break if tamper or attempted removal. * Highly readable, crisp graphics over white background. 1,000 White Destructible Security Labels 1.5" x 0.6" (38mm x 15mm), Custom Print. >Click on item details to customize it. 5,000 White Destructible Security Labels 1" x 0.375" (25mm x 9mm), Custom Print. >Click on item details to customize it. 500 White Destructible Security Labels 2" x 0.75" (50mm x 19mm), Custom Print. >Click on item details to customize it. 2,000 White Destructible Security Labels 1.5" x 0.6" (38mm x 15mm), Custom Print. >Click on item details to customize it. 10,000 White Destructible Security Labels 2" x 0.75" (50mm x 19mm), Custom Print. >Click on item details to customize it. 2,000 White Destructible Security Labels 1" x 0.375" (25mm x 9mm), Custom Print. >Click on item details to customize it. 500 White Destructible Security Labels 1.5" x 0.6" (38mm x 15mm), Custom Print. >Click on item details to customize it. 5,000 White Destructible Security Labels 2" x 0.75" (50mm x 19mm), Custom Print. >Click on item details to customize it.